It’s time for the annual Stanger Young Artists Concerto Audition on Saturday, February 16, from 9 a.m. to 4:15 p.m. This annual event is presented by the Elmhurst Symphony Orchestra and the Elmhurst Kiwanis Club. 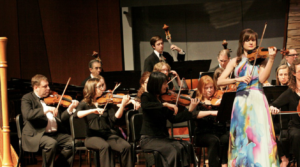 This year, 22 talented students from local high schools will audition at the Elmhurst Christian Reformed Church for the chance to perform a concerto movement live onstage with the Elmhurst Symphony Orchestra. All of us at Elmhurst Toyota encourage you to stop by this free event and show your appreciation for our outstanding local high school musicians. Student auditions are held every 15 minutes from 9-11:45 a.m. and 1-4 p.m. The students will perform music from various composers on instruments that include the French horn, cello, viola, violin, piano, flute and string bass. They’ll need to impress three judges if they want to perform with the Elmhurst Symphony Orchestra. You are invited to drop in and listen for as long as you’d like, but please enter and exit the event during audition transitions (at the end of each musician’s 15-minute audition time) so you don’t distract the students. Elmhurst Kiwanis Club. Student musicians who finish in the top four spots of the concerto competition will receive monetary prizes. The best student musician earns the privilege of performing with the Elmhurst Symphony Orchestra during its 2019-2020 season. The three remaining students in the top four are invited to perform at local community group meetings. In addition to the concerto auditions, you’re invited to the Stanger Audition Lunch from 12-1 p.m. It’s held at Park Place, conveniently located adjacent to the Elmhurst Reformed Christian Church. Tickets for lunch are $23 per person. For menu options or to purchase tickets, please visit the Elmhurst Symphony Orchestra’s website at www.elmhurstsymphony.org or call 630-941-0202. Whether you love music or just want to show your support for talented students, make plans now to attend the Stanger Young Artists Concerto Audition. The Stanger Young Artists Concerto Audition is on Saturday, February 16, 2019, from 9-11:45 a.m. and 1-4:15 p.m. Doors open at 8:30 a.m. The Stanger Audition Lunch is from 12-1 p.m. The auditions are free to watch. The price of the Stanger Audition Lunch is $23 per person.